This February has been a month of drama for the search industry. 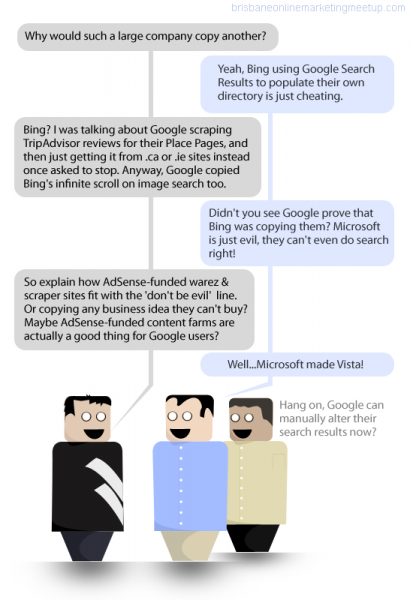 It started with Google accusing Bing of cheating at a search panel at the start of the month. Google followed up the lively panel discussion by publishing a lot of screenshots explaining why they are convinced that Bing was using their search results as a ranking factor. The write-up on how they did this is pretty comprehensive, but just briefly: they planted artificial queries and set sites to rank for them within their own live directory. They then used the queries and clicked on the links they planted there with computers running Windows, Internet Explorer and with the Bing toolbar installed. It was published on Google’s official blog after the talk, and found its way into the USA’s mainstream media, in a severely abridged form. Bing responded shortly after as well, and put their case forward on their own blog. In the discussion that developed around this very public fight, kilobytes of text were used to list which search engine came up with what. Google’s copying of Bing’s left column and infinite image search scroll were mentioned, as was Google’s universal search. Issues like whose content Google was incorporating into their own product, sometimes against the owner’s wishes, emerged too. Google’s original statements regarding their own manual control over a site’s position in search emerged, and their original statement “we do not have the capability to manually change it” was brought up. In all the excitement however everyone seemed to forget what the search panel was expected to be about: content farms, and poor quality content funded by AdSense. The discussion about search quality that permeated the search and Internet marketing community seemed to be forgotten. Even the long running debate over whether or not Google was favouring their own products, such as YouTube and Google Places, was forgotten for a little while.